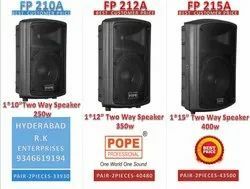 Providing you the best range of pope active speakers with effective & timely delivery. The POPE Professional® FP series High quality active (powered) speakers provides, professional sound performance with a reasonable price ratio. The new generation of the POPE Professional's powered speaker family, has been adapted to the requirements of musicians and DJs. As a result of its three band equalizers sound set-up, it offers the best possible characteristics of sound reinforcement for live music as well as playback or speech. The new, more compact multi-functional cabinet creates an ideal connection between acoustic necessity and practical handling. Looking for Active Powered Speakers ?